The Gull Wing conservatory is a step up from a traditional Lean to conservatory. A hipped Lean to is how its known in the trade and is great for bringing extra space and light into any home. The Gull Wing is perfect for those on a budget looking to increase living space whilst keeping costs down, and when you 'do it yourself' the costs really couldn't be lower! 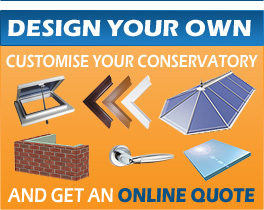 So go on, why not get a quote today and see how much you can save when you DIY with Self Build Conservatories.